This blog is for favorite prayers and scripture. Let us ponder The Word of God.© Faith of the Fathers, 2005-2018. All rights reserved. "Hail, holy parent, who didst bring trth the King Who rules heaven and earth forever. My heart hath uttered a good word; I speak of my works for the King." 1. 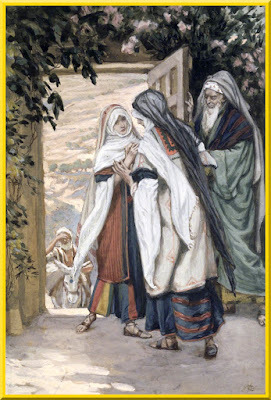 As soon as Mary heard that Elizabeth was with child she hastened to her. The alacrity of the Blessed Virgin teaches us that we should take part with gladness in the happiness of our fellow-men, and quickly make ourselves ready to discharge our duties, sacrificing for that object, if necessary, even our own much-loved retirement, our devotions and other exercises of piety. 2. Mary visited her cousin out of real love, not out of unmeaning ceremony. Would that her example were followed in our visits! 3. By the visit of the Blessed Virgin John was sanctified in his mother's womb, and Elizabeth, enlightened by the Holy Ghost, knew, by the miraculous movements of her child, that Mary was the Mother of the Lord. Such effects did this visit produce. What would Jesus effect in us if we received Him with due preparation! Explanation of the Canticle "Magnificat," Or "My Soul Doth Magnify The Lord"
COLLECT Grant, we beseech Thee, O Almighty God, that we who believe Thy only-begotten Son, our Redeemer, to have this day ascended into the heavens, may ourselves also in, mind dwell amid heavenly things. Through the same etc. LESSON (Acts 1:1-11) The former treatise I made, O Theophilus, of all things which Jesus began to do and to teach , until the day on which, giving commandments by the Holy Ghost to the apostles ,whom he had chosen, he was taken up: to whom also he showed himself alive after his passion, by many proofs, for forty days appearing to them, and speaking of the kingdom of God. And eating together with them, he commanded them that they should not depart from Jerusalem, but should wait for the promise of the Father, which you have heard (saith he) by my mouth: for John indeed baptized with water, but you shall be baptized with the Holy Ghost, not many days hence. They, therefore, who were come together, asked him, saying: Lord, wilt thou at this time restore the kingdom to Israel? But he said to diem: It is not for you to know the times or moments which the Father hath put in his own power; but you shall receive the power of the Holy Ghost coming upon you, and you shall be witnesses to me in Jerusalem and in all Judea, and Samaria, and even to the uttermost part of the earth. And when he had said these things, while they looked on, he was raised up; and a cloud received him out of their sight. And while they were beholding him going up to heaven, behold, two men stood by them in white garments, who also said: Ye men of Galilee, why stand yon looking up to heaven? 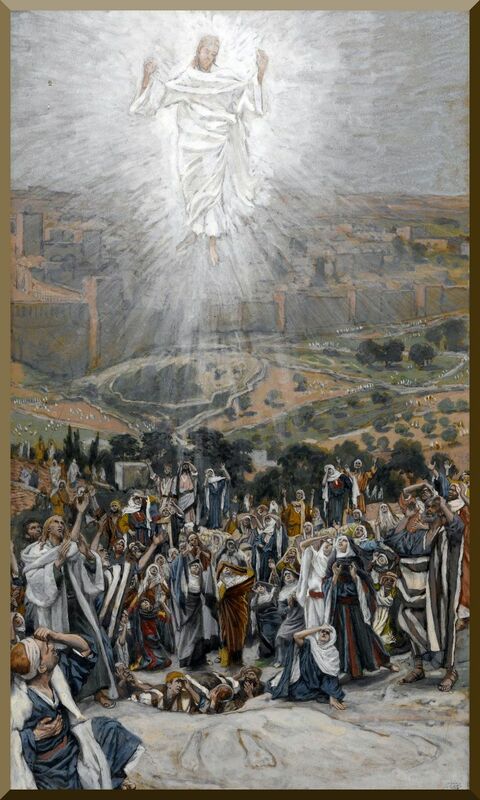 This Jesus who is taken up from you into heaven, shall so come, as you have seen him going into heaven. 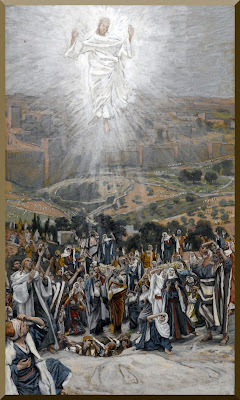 GOSPEL (Mark 16:14-20) At that time, Jesus appeared to the eleven as they were at table: and he upbraided them with their incredulity and hardness of heart, because they did not believe them who had seen him after he was risen again. (And he said to them: Go ye into the whole world, and preach the gospel to every creature. He that believeth and is baptized shall be saved: but he that believeth not shall be condemned: And these signs shall follow them that believe. In my name they shall cast out devils: they shall speak with new tongues; they shall take up serpents: and if they shall drink any deadly thing, it shall not hurt them: they shall lay their hands upon the sick; and they shall recover.) And the Lord Jesus after he had spoken to them, was taken up into heaven, and sitteth on the right hand of God. But they going forth preached everywhere, the Lord work­ing withal, and confirming the word with signs that followed. Why did Christ say to His apostles: Go ye into the whale world and preach the gospel to all creatures? To show that no one is to assume the office of preaching, but must look for his mission from the lawful pastors of the Church. And when Christ sends His apostles into the whole worlds to all nations without exception, He shows His willingness to save all men. If the designs of God are not fulfilled, the blame is not to be attributed to God, but to man, who either does not accept the doctrine of the gospel, or accepting, does not live in accordance with it, or else renders himself by his obduracy in vice, unworthy of the gospel. No, faith that is not active in love, not fruitful in good works, and therefore not meritorious, (Galatians 5:6.) is not sufficient for salvation. "Such faith," says St. Anselm, "is not the faith of a Christian, but the faith of the devil." Only he who truly believes in Christ and His doctrine, and lives in accordance with it, will be saved. St. Gregory very beautifully replies to this question: "Because the Redeemer said that true faith would be accompanied by miracles, you must not think that you have not the faith, because these signs do not follow; these miracles had to be wrought in the beginning of the Church, because faith in her had to be increased by these visible signs of divine power." And even now when such signs are necessary for the propagation of the faith, and victory over unbelief, God gives His faithful power to work them. In the presence of His apostles, and many of His dis­ciples, whom He had previously blessed, (Luke 24:51) and who, as St. Leo says, derived consoling joy from His ascension. Rejoice, also, O Christian foul, for Christ has today opened heaven for you, and you may enter it, if you believe in Christ, and live in accordance with that faith. St. Augustine says: "Let us ascend in spirit with Christ, that when His day comes, we may follow with our body. Subscribe Now: Get the Latest Posts From ALL Faith of the Fathers Blogs In One Feed! The 7 gifts of the Holy Spirit: explained. Standing Before Mount Carmel | Reflections on Carmelite and non-Carmelite spirituality in Catholicism with an emphasis on traditional expressions of the faith.